This is why Syriza's negotiating strategy has to play to the European gallery and not just to the suits in the conference room. The aim is to persuade people to put pressure on their own governments or change them in the coming elections. 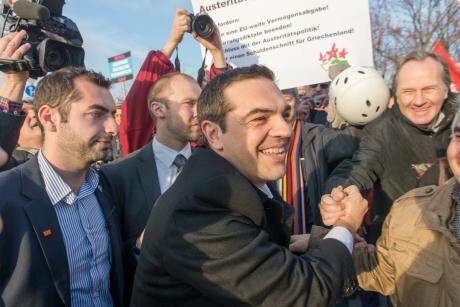 Alexis Tsipras greets supporters in Berlin before a meeting with Angela Merkel. Demotix/Florian Boillot. All rights reserved.The novel A Very British Coup was written by the Labour MP Chris Mullin in 1982. Inspired by Tony Benn’s candidacy to become Deputy Leader, it tells the story of Harry Perkins, a working class, left-wing leader of the party, winning the 1991 elections. The Labour manifesto promises to break up media monopolies, withdraw from NATO and the EU, remove American military bases, abolish the House of Lords and public schools and introduce true open government. To avoid the conditions of the IMF, the government agrees a loan with the Soviet Union. The fearful establishment organizes an elaborate conspiracy. Media magnates, top civil servants, the financial world, the MI5 and the CIA conspire to stop the government. The stock market and the pound fall dramatically, firms close factories and relocate overseas, a bank run is orchestrated. Extramarital affairs and youthful misdemeanors are plastered all over the papers. Eventually after an accident in a nuclear plant, probably engineered by the conspirators, the government resigns. In 1997, Turkey experienced a real postmodern coup. The Turkish Security Council published a memorandum on the Army website asking the government to change its policies. Within a couple of days the Erbakan government resigned and his party was dissolved. The resentment against the Army and the deep state eventually led to the repeated victories of Erdogan, Erbakan’s political heir. Sometimes conspiracies work against the conspirators. The negotiations over the future of Greece dominating our news are nothing less than a very European coup. It follows the steps of the English novel and the Turkish putsch. The Europeans do not threaten with tanks but with the euro printing presses. The coup started with setting tight time limits on the incoming government. They had to negotiate and conclude an agreement about the existing loan within a couple of weeks of assuming office. When a framework agreement was reached on February 25, German finance Minister Wolfgang Schäuble started issuing increasingly hostile ultimatums. We are not negotiating, said Mr. Schäuble, you have to continue with the previous programme. The Greek proposals are naïve, a “Trojan horse”, beware of Greeks bearing gifts, the Germans insisted. Following the German lead, the black arts of threat, blackmail and misinformation have been put into overdrive. Daily anonymous briefings and hostile commentary against the government in the press are accompanied by official threats about a pending ‘Grexit’. The Greek government did not reciprocate. It did not attack its tormentors and it formally complained about the continuous leaking of its negotiating position to the press despite a confidentiality agreement. No other interpretation can explain the emerging establishment position except “Get Syriza”: either overthrow the government or make it accept such humiliating conditions that it would lose popular support or make the party split. Yanis Varoufakis was told that if there is a liquidity problem the government should not pay salaries and pensions for a couple of months. The attacks soon took on a personal dimension - Varoufakis was attacked for his dress-code, didacticism, academicism and bad manners. He is “foolishly naïve”, he should be replaced - giving rise to a diplomatic incident with the Greek ambassador in Berlin lodging a formal complaint. The CEO of the Frankfurt stock exchange called Tsipras and Varoufakis “Taliban”, while Spiegel claimed that Varoufakis displays symptoms of psychosis. Like a schizophrenic he believes in a parallel reality in which it is not Syriza to blame but the capitalism around it. The threats have been followed by punitive measures bordering on illegality. They have been described as fiscal strangulation and liquidity Chinese water torture. The Europeans are not returning to Greece the 1.9bl owed by the ECB on Greek bonds or any part of the last installment of 7bl from the previous agreement. Furthermore, the ECB piled on the pressure by pulling the normal credit lines and capping emergency lending. Mario Draghi, totally inappropriately for a “neutral” central banker, stated that if Greece continues with the privatisation of airports, it may receive some of the sums owed. As far as liquidity is concerned, the ECB has adopted a drip-drip approach offering small sums of euros to the banks and keeping them begging on a weekly basis. This is probably illegal. Greece is still part of the old bailout programme. The ECB as the issuing bank is legally obliged to offer liquidity to the Eurozone commercial banks. The threats and blackmails have been self-fulfilling. People removed deposits from savings accounts creating the possibility of a bank-run which could lead to capital controls. However it is clear to anyone visiting Athens that there is no panic. The bars and tavernas are still busy. People will have just one drink or the cheapest food on the menu. After five years of catastrophic policies, stoicism and hope is the best response to the threats. Did the coup succeed? Yes and no. The blackmail meant that the government had to water down many promises, to give up the power of every sovereign state to take unilateral actions affecting its fiscal position and to submit its economic policies to the lenders for approval. On the other hand, there were successes. To understand these so-called negotiations let me use the theory of guerilla warfare. In an asymmetrical war, the weaker force aims to preserve its strength, to resist and to reduce the enemy’s ability by attacking his weak points. It uses quick forays and retreats, skirmishes and ceasefires. The aim is to prolong the struggle, to gain time for the next moves and to secure space, by changing the terrain to more favourable territory. It must preserve safe places for retreat and lines of flight for re-supplying and re-building its forces. The inequality of material arms makes the use of moral resources central. The weak side must maintain its capacity while avoiding the escalation of violence that would lead to certain defeat. In this sense, the Greeks are fighting a guerilla war. The strategy is to move negotiations from an all or nothing war to terrains where Syriza has a relative advantage. Buying time and gaining space is the aim. This is done by moving the negotiations as far as possible from unaccountable technocrats to institutions where political intervention – even the minimal activity of the EU summits and council meetings - has some role and, second, by triangulating - by introducing, directly or indirectly, third parties into the negotiations. Buying time is necessary for a number of reasons. The election victory does not mean that the government has acquired power or ideological hegemony. It resembles a government in exile. Time is necessary therefore in order to gain control of a hostile state machinery and to prepare the specific policies that would implement its election promises. This takes time for inexperienced politicians never before in government positions, facing hostility or indifference from the civil service. The government needs time in order to communicate internally and internationally the new direction against the resistance and incomprehension they receive from officials and from media. Finally, time is necessary to start building collaborations and alliances with anyone prepared to accept that democratic decisions should override the markets. The time won is necessary in order to gain space and change the terrain towards friendlier territory. 1. The first tactic is to complicate the negotiations by introducing directly or indirectly third parties or issues considered extrinsic to the table. The visits by Premier Alexis Tsipras and senior government ministers to Russia, USA, China and Latin America move in this direction. The strategy is to show that the fate of Greece will affect economic but also geopolitical and security concerns. They remind the other side of the crucial position of Greece in a corner of the world in flames from Ukraine to Syria, Iraq, the Middle East and North Africa. 2. The terrain is also changed when the negotiating narrative is disrupted through the passing of legislation aimed at reversing the humanitarian crisis and its main causes: corruption, tax avoidance and tax evasion. These measures help the most impoverished part of the population. 300,000 families will receive free electricity, food vouchers and subsidies for rent. Close to four million families and small businesses will be given the chance to pay their tax, social security and other debt arrears in 100 installments. Finally, the foreclosure of family homes will be banned. As a first symbolic move, this law indicates that the commitment of the government to social justice is not negotiable. 3. Guerilla war depends on the help of a sympathetic public. Syriza must therefore consolidate the home front. The reversal of the humanitarian crisis helps those in need but also keeps the support of the larger part of the population not directly benefiting from those measures. This will be crucial if the negotiations collapse and more radical steps, such as a referendum or new elections are considered. The government has so far succeeded. The support of the people for its negotiating position is around 60%, while the PM Tsipras has an approval rating close to 80%, despite blanket hostility from the Greek establishment media. It makes sense. A feeling of national dignity and honour has returned after five years of repeated and ritual humiliation. 4. When the material weapons are non-existent, resistance has to resort to moral arguments, moving from the financial to the ethical. The emphasis on the humanitarian crisis is part of this redirection of the negotiations. Recent humanitarian crises were triggered by natural causes, such as famine, earthquake or tsunami. By insisting on the existence of a humanitarian crisis, the government has succeeded in registering the extent and the nature of this crisis as man-made. It is the austerity policies that inflicted the catastrophe. Their authors bear moral and perhaps legal responsibility. The reactivation of the claim for reparations for the Nazi atrocities, with the concept of crimes against humanity that lies at its heart, makes the link stronger. Austerity is a moral wrong: it leads to humanitarian catastrophe and may amount to a crime. This is why Dijsselbloem, the head of the Eurogroup, and Costello, an EU official, tried to stop the bill addressing the crisis because of its fiscal repercussions. The law is now in effect offering support to the most vulnerable and the liability of Europe for the catastrophe has been admitted, opening the way for further claims. 5. The elevation of humanitarian crisis into a key negotiating position uses its symbolic capital but re-signifies its meaning. The victims of recent humanitarian crises are presented as passive, devoid of political agency. They were the grateful recipients of philanthropic help from Bono, Bob Geldof, Angelina Jolie and the rich North. The Greeks rejected their victimization. Their response to the crisis was not individual relief but collective resistance and solidarity. The solidarity networks that have spread throughout Greece are not just helping people who need it. They turned the thousands of volunteers from passive subjects to active agents of change. When elections were called, they elected a government with a clear mandate to transfer resistance from the streets to the negotiating table. 6. The humanitarian negotiating position is moral and symbolic. It must be communicated in order to introduce the Greek and European publics as active spectators and participants to the negotiating table. Those who gave freely for the relief of the Ethiopians or the Indonesians are more receptive to moral than economic arguments, to stories of great suffering than to the recitation of deficit and debt figures. Immanuel Kant argued that when the European public celebrated the French revolution, this gave evidence of the moral progress of humanity. If the European public supports the Greeks in their asymmetric negotiation, it will give evidence of our belief in democracy. This is why the negotiating strategy has to play to the European gallery and not just to the suits in the conference room. The Greek position has to be communicated and performed to different audiences. Stopping home repossessions and reconnecting electricity is of huge importance to the Spaniards; stopping water and other utility privatisations to the Irish; giving good arguments about the catastrophic effects of austerity to the British. The aim is to persuade people to put pressure on their own governments or change them in the coming elections. The Greek position has a theatrical aspect which necessarily attracts interest in the persons involved. Varoufakis is a great economist and teacher but also an actor and celebrity. Getting the public involved exposes the protagonists both to great acclaim and to personal vituperation. The fact that the German government has asked for Varoufakis to be removed from the Finance Ministry indicates that he is succeeding. 7. The Greek government must continue addressing the European public and governments above the heads of the hostile Berlin and Frankfurt establishment. They must keep telling people in London, Madrid and Dublin that elections matter and that democratically elected governments have greater legitimacy, if not greater power, than financial markets. This approach was apparent in the greatest concession of the government in the February 25 agreement. A standard media accusation has been that German citizens are paying for the Greek debt. It is a false claim, which has been neutralized however by the temporary suspension of the call for a debt write-down. Again this opening up to the Europeans of good faith is apparent in the acceptance of the demand for balanced budgets and fiscal discipline. The previous government’s agreement to seek up to 5% annual primary surpluses was dropped as economically illiterate and socially catastrophic. But internal devaluation, the second aim of the austerity memoranda, was comprehensively rejected. Growth has to come through redistributive measures instead of the imposition of Chinese wages and labour conditions. What about Grexit? A voluntary exit would be political suicide. The reasons are clear. The living standards of the population have fallen by 35%. This would be further increased by the amount of devaluation of the drachma (20, 30, 50%?) plus perhaps another 10%. Proponents of Grexit suggest that capital controls should be imposed and basics such as food, medicine and fuel should perhaps be rationed. Greece is an import-led economy. The currently predominant European trade will have to be redirected to others, a prospect that is easier said than done. Finally, while the government will be able to impose a unilateral debt haircut, that will exclude Greece from the markets for the foreseeable future. According to most forecasts, it will take between 12 and 36 months before the results of the devaluation are felt and the economy starts recovering, if it does. It is the perfect storm for a government of the Left. The final outcome will depend partly on the negotiations taking place in the next four months but more importantly on the improvement of the lives of ordinary people and their continued support for the government. If the Europeans insist on the continuation of austerity, the further reduction of salaries and pensions, Syriza has the nuclear option in its arsenal. Calling a referendum on a European deal that breaches its red lines or even a new election in order to get a clear majority in the house for its legislative programme. The Syriza victory was the first success of the anti-austerity forces in Europe. The dominant paradigm places markets above people, marginalises democracy, transfers massively wealth from the rich to the poor and demonises immigrants. Despite the failures, dislocations and disasters of the dominant theory, many people have accepted that there is no alternative, have abandoned any hope of change and have downgraded their life aspirations. This is where the Syriza victory may become the beginning of a new paradigm. People who for thirty years heard the TINA dogma now hear a different interpretation of the world. Take some key changes in the dominant position. The Greek debt, Syriza argues, is part of a European crisis and must be dealt at the European level. The European Union should convene a debt conference similar to the 1953 London conference, which reduced the German debt. The ECB must take on a large part of the debt of all indebted European states, reducing their burden to viable levels. Its repayment should be pegged to an economic development clause. Or, take the treatment of immigrants brought tragically home by the drowning of 800 people in the Mediterranean, the sea at the ‘centre of the earth’, which has turned into a floating graveyard. Greece is the second largest point of entry into the EU after Italy. Yet, in a radical change from most European governments, the Greeks are passing a law which will give citizenship to all second generation immigrants and those who had the larger part of their schooling in the country. The camps for undocumented immigrants have been closed and people have been moved to open accommodation. Educating people about the benefits of immigration and combatting racism is the last defence of Enlightenment values. The alternative is a nightmare scenario of racist or neo-Nazi parties, like Golden Dawn, entering the mainstream. The Greek predicament is the symptom of a major legitimation crisis that will define the future of Europe. Liberal democracy is a post-war European phenomenon. It combined the operation of the markets with a correction in the name of social justice. As Wolfgang Streeck has argued, the compromise worked because democratic politics intervened in the economy and mitigated market decisions in favour of working people. Capitalism and democracy operate different principles of distribution. In market or legal justice, distribution is carried out according to market decisions and property entitlements regulated by contract law. Social justice is determined by collective ideas of fairness, correctness and reciprocity. It ensures that everyone enjoys a minimum livelihood and recognition of civil and human rights to health, social security, public participation and employment protection, irrespective of economic performance or productivity. Capitalist justice is decided by ‘perfect’ markets that give rise to efficient results expressed in prices. Social justice is constructed according to cultural and political considerations and is expressed in decisions of formal and informal institutions including elections. It represents the Enlightenment ideas of equality, solidarity and democracy. This compromise has been unravelling in the last thirty years. Neoliberalism frees the market from its correction by politics, considered as a hindrance to economic efficiency. It does not care for citizen consent – except at election time – but for the trust of the markets. The Syriza victory challenges this dogma. In this sense, the future of Europe and the Left – the whole Left including the social democratic and labour parties – may depend on the outcome of the Greek drama. The pacification of old national antagonisms, the greatest achievement of the EU, has started unravelling. The vitriolic attacks by the Greek media on Germany and by the German on Greece are turning an economic and class crisis into ethnic conflict. Irrespective of outcome, the claim for reparations from the North for the profits made out of the crisis will poison future developments and will be a permanent threat to the Union. The Left too will be seriously defeated if Syriza is made to capitulate. Democracy and social justice will lose its battle with greedy capitalism for a generation. It is a scary prospect. Syriza has set out its detailed programme for the first period in government. Its economists are some of the best in Greece with wide international recognition. But there is no single blueprint or precedent for the democratic socialism of the twenty first century. The Left will have to improvise and adjust, to become brutally pragmatic and uncompromisingly principled. Planning, developing policies, preparing has been going on bigtime. But there is also the challenge of and response to events, the contingency of what happens. The government will have to experiment, use the collective imagination of the people, the experience and know how of the hundreds of solidarity campaigns and social economy initiatives and the entrepreneurial innovations of the highly skilled and educated youth. It is a tall order for a small country and party. Can Syriza succeed? There are acts you prepare for and others that hit you on the head, like a miracle or earthquake. You are never ready to fall in love or to start a revolution. The decision, the act is a little like madness, it takes over. Syriza has been adopted by the people as the subject of radical change. As Immanuel Kant put it, because it must succeed, it will. But the paradigm will shift, if people around Europe realise that the dominant model has failed and must be replaced root and branch. Europe will have to choose between the disasters of austerity and the hope of new community. The signs are mildly optimistic. History has started moving again.